Oh, its Wednesday middle of the week. I went for a bike ride this morning and it was fairly cool out. It was like an early fall day, but by the time I was riding back home the sun had decided to shine. If you saw my recipe from yesterday the Mediterranean chickpea salad, I used a can of chickpeas for the recipe, instead of throwing away the aquafaba I saved it in the fridge. Aquafaba is the chickpea water that the chickpeas sit in. 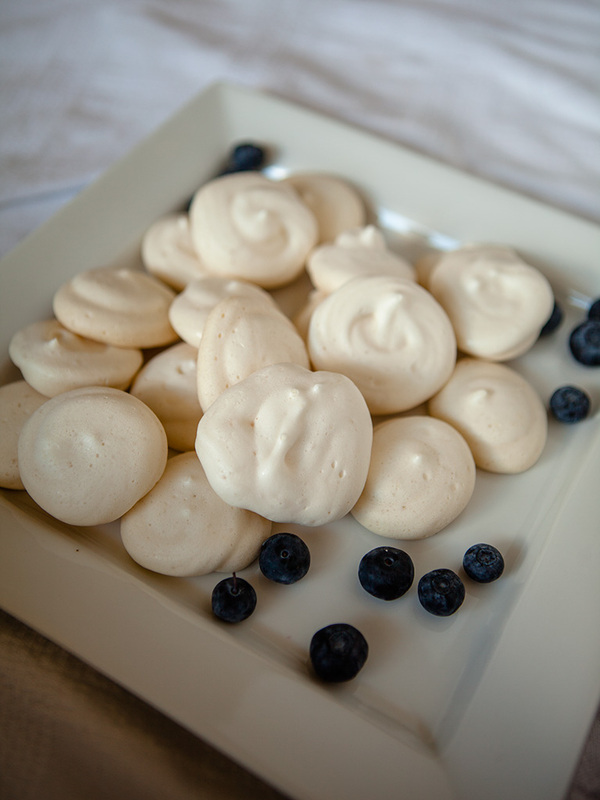 I’ve always been curious about making vegan meringues. I’ve always been thinking how can this liquid turn into delicious meringues, and I love meringues. Everyone knows meringues is like eating pure sugar. It’s not something I would eat on a daily basis or even weekly, but as a treat it’s divine. Meringues are best served with fresh fruit and coconut cream or yogurt. Well for my first try, they taste just like meringue so I was very happy with the taste for the simple 4 ingredients that are in them. I have to learn how to make them look more fancy, instead of a little white blobs lol. With a little practice and an icing bag this can be accomplished. I left the aquafaba in the fridge overnight and it seemed to thicken a little. I used Wholesome Sweeteners Organic Icing Sugar, you can make your own but this sugar is great for this recipe. I made 30 bite sized meringue cookies but the recipe can be used to make bigger nest sized meringues. If you make bigger meringues remember they will need longer to cook. I felt if they are at least bite size that’s not too much sugar all at once but they are quite addictive little treats, lol try and eat just one I bet you can’t. 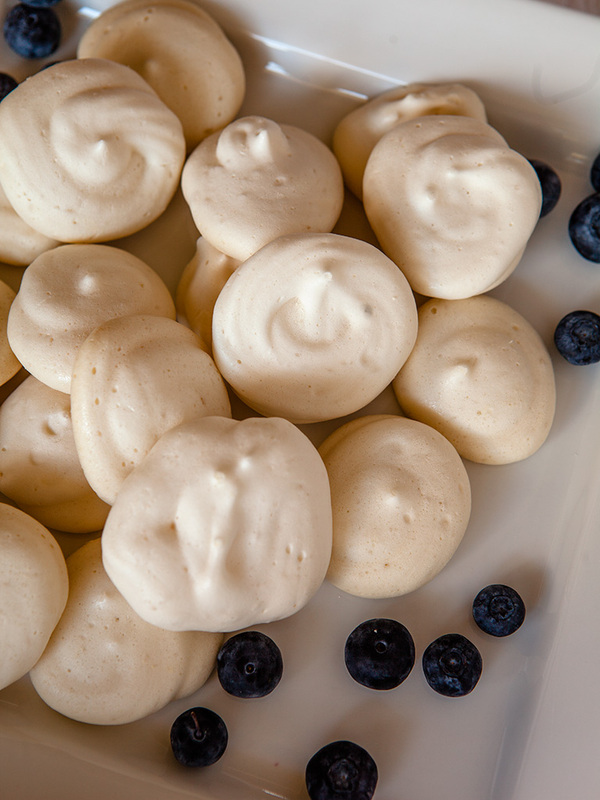 Leave aquafaba in fridge overnight. 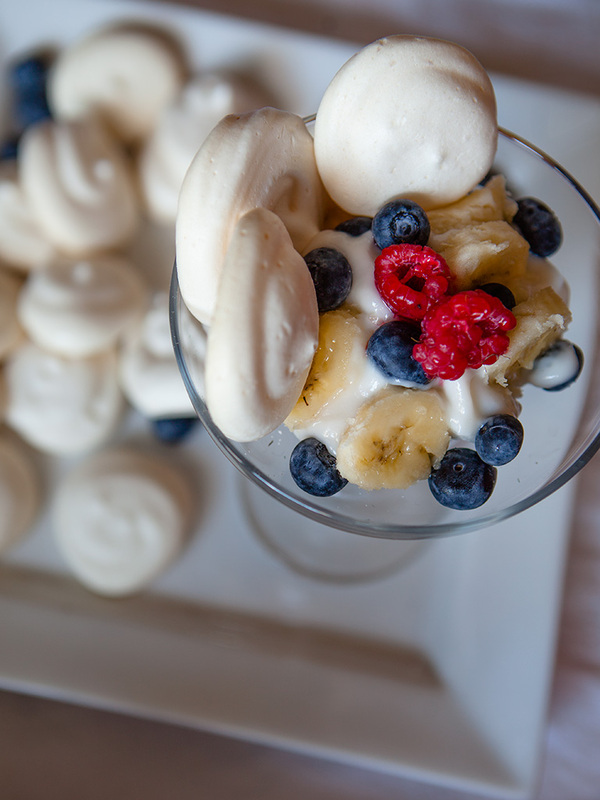 Add the aquafaba to a the bowl of stand mixer. Whisk on high until it's more than doubled in size and its white and foamy. Add the cream of tartar and whisk again for another minute. Add the vanilla and whisk. Slowly add the sugar a tablespoon at a time whisking until the mixture forms stiff peaks about 3-4 minutes You should be able to hold the mixing bowl upside down and have the meringue stay in place. Transfer the meringue mixture into a icing bag and pipe into little button shapes. Alternatively, just use a spoon to create mounds. Bake for 1 hour 30 minutes. Do not open the oven. Turn the oven off and leave them to cool in the oven for at least 45-60 minutes. 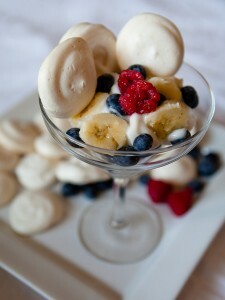 To serve, add a meringue with fresh fruit and coconut yogurt. 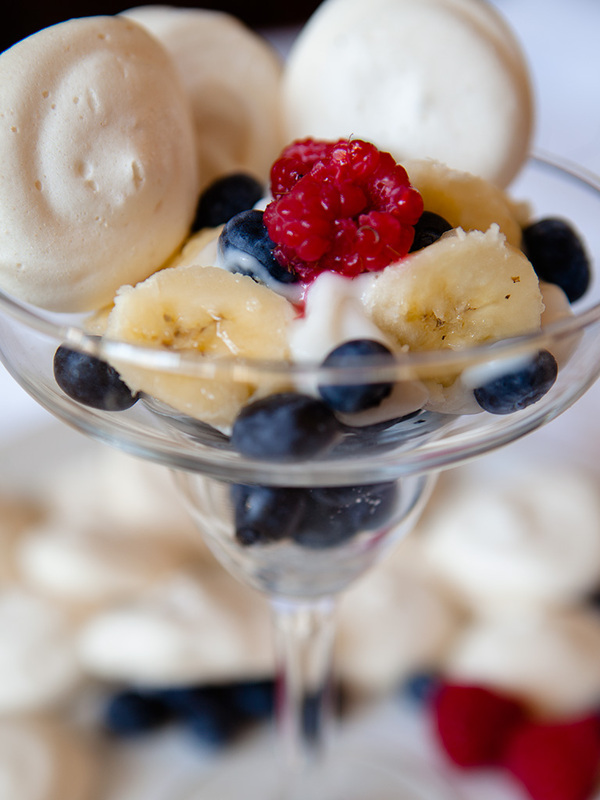 Place blueberries in bottom of glass, top with coconut yogurt then layer bananas and more blueberries, garnish with a couple raspberries. Place 2-3 meringue cookies on side of glass. Meringues can be stored in an airtight container.